Home > Posts > News > Implantations > Quebecer advertising agency Camden sets up in Lyon! Founded in 1991 in Montreal, Camden has chosen Lyon as its European hub for its internationalisation. 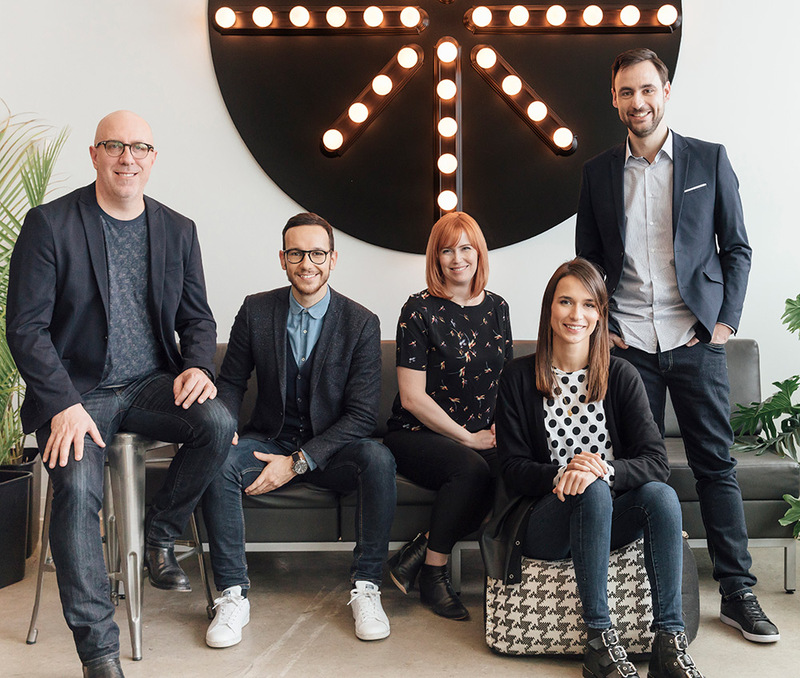 In 2016, following the acquisition of the Quebec design agency CGCOM, and the opening of a satellite office in Toronto in 2017, Camden is consolidating its development strategy according to the unique model of a decentralised advertising group. On 23 May, it officially launched the new Camden Lyon agency, which is now also the new identity of Lyon agency ‘Les Distilleurs’, because Camden Lyon was created from the meeting of minds between Montrealer and Lyonnais professionals! Under the banner Camden Lyon, the founders of Les Distilleurs, Fanny Mounier, Lionel Farget and Thomas Ardisson, welcome Camden President Matthieu Bédard, and the group’s first Vice-President Marie-Michèle Jacques, as well as Anne-Christine Normand, formerly a studio director in Montreal, who will be the Lyon office’s Director of Operations. With this new partnership, Camden aims to increase its development and production capabilities, to continue to grow and offer its customers a broader range of services. Aderly advised Camden before this move, providing the team with an overview of the market and actors in this sector, and by connecting the group with these actors. The Agency helped the group’s newcomers by making them part of the ONLYLYON Ambassadors’ network. …as well as many other reasons! It is true that Lyon has a special relationship with Montreal. Among others, the opening of a direct flight between the two cities in 2016, operated by Air Canada. Camden‘s strength lies model of governance. The group is subdivided into several agencies, each with its own expertise, but most importantly, these agencies offer a wide range of complementary services: from strategic planning to Google Partner certification, through naming, branding, design, film production, and many other services! The group thus represents a single point of contact for several centres of expertise, for a comprehensive offer. Furthermore, it does this while maintaining a very “human” scale (under 50 employees per agency) all the better to offer a service base on proximity and collaboration, meaning we can adapt our services to SMEs and organisations with complex needs. By doing this, Camden works hard to preserve its DNA, and to sustain its strategic creativity and excellence. Watch Camden Lyon’s launch on video !